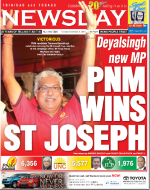 Published on November 3, 2013 in General T&T, ILP, Law, Opposition Party, People's Partnership, PNM, Politics and UNC. 1 Comment Tags: Jack Warner, Kamla Persad-Bissessar, Politics, Raffique Shah, T&T Govt. When the votes are counted tomorrow night, the St Joseph by-election will bring to closure what may well be the most torturous year in the electoral history of this country. Two scheduled elections—the THA in January and local government last month—and two unscheduled by-elections have left us numb from campaign punishment.